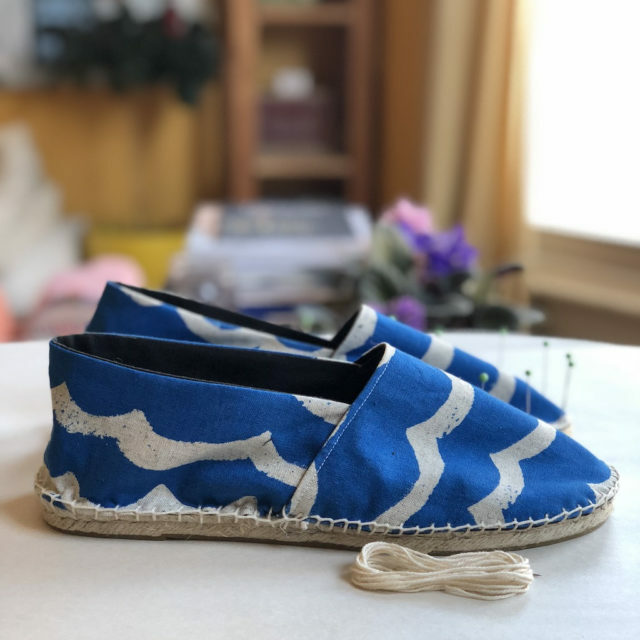 My humble espadrille kits have gone on quite the journey and I am so pleased to share the results with you. 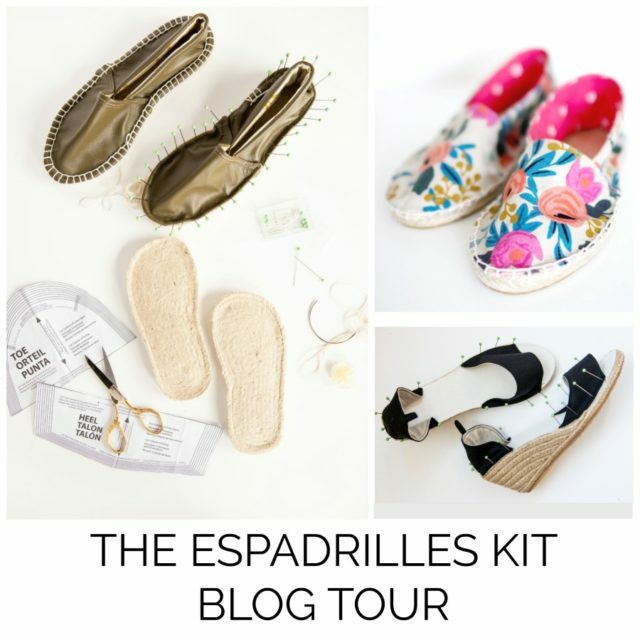 It’s time to showcase the espadrilles kit blog tour! 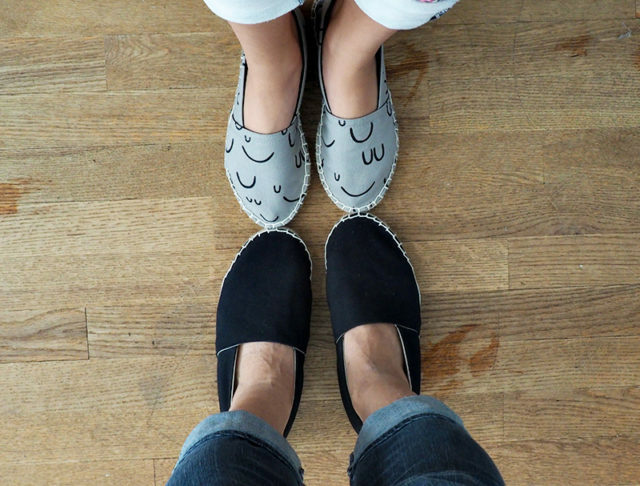 Six fabulous bloggers made shoes using everything from the STARTER KIT to the I GOT IT kit (and even the upcoming Wedges and Toddler kits!) and the results blew me away. It’s so much fun to see people execute their own vision especially when they all turn out as beautiful as these shoes did. First up, was Jane from Buzzmills. She picked a STARTER KIT from the floral collection, which comes with lush Rifle Paper Co. canvas. 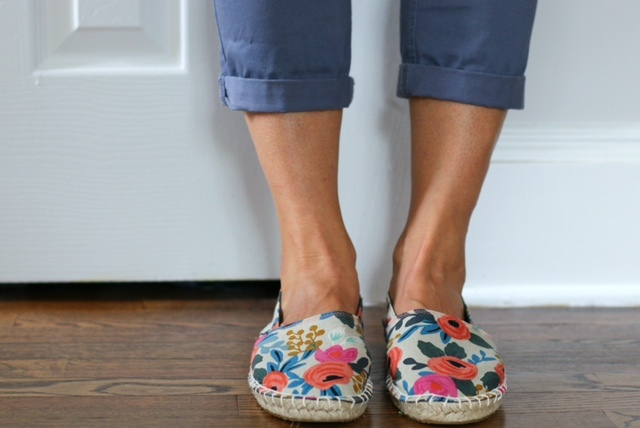 How perfectly adorable are these Canvas Les Fleur espadrilles she made for herself? Jane says she found the shoes “really straight forward to make, fairly simply and super duper satisfying!” I couldn’t agree more, Jane! Check out Jane’s blog for the full details and other sewing goodness. 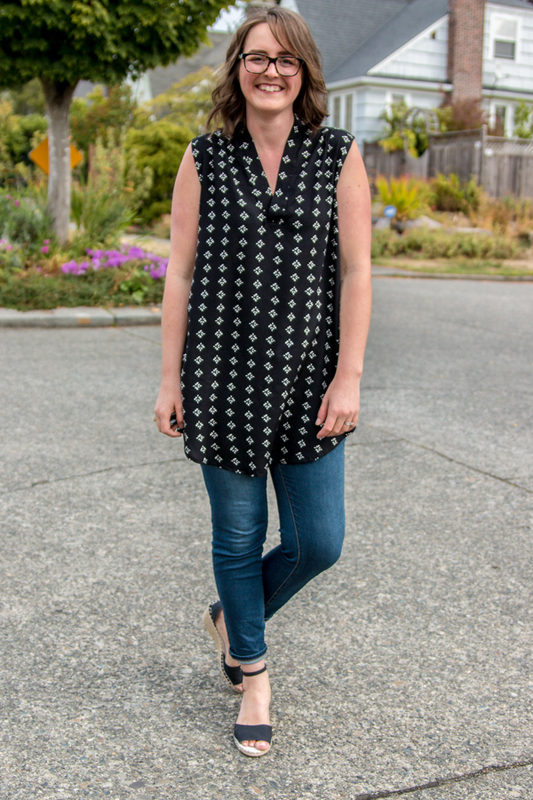 Melissa from Blank Slate Patterns and Melly Sews decided to create TWO pairs. Both of them made me squeal out loud. Melissa has super tiny feet, so she happy to see that I carry tiny shoe sizes (even her bitty size 4s!). Melissa experimented with the I GOT IT kit, which doesn’t come with fabric. She created her own embroidery(Is there anything she can’t do?!) for the toe and attached a lush pink ribbon at the ankle for the sweetest sandals. She also whipped up a classic pair in the same fabric as Jane with the floral STARTER kit. Sonya Philip from 100 Acts of Sewing whose spectacular use of color and layered pattern combinations have long been an inspiration to me (and so many others), made a characteristically modern pair. Her shoes are in one of my favorite prints and I am floored at how lovely they turned out. Of course, these espadrilles will look so good with all her other amazing handmade goodness. This fabric has sadly sold out! Sorry! But similarly fun prints are found in my Abstract STARTER collection. They turned out so cute but a wee bit big. Similar to handmade garments, fitting issues do come up with shoe-making! I know, annoying. It’s nice when things work out the first time. To help out with fitting, my instruction booklet includes ideas for getting a good fit on the back page. Sonya’s plan is to re-stitch this pair to grab a bit more fabric with each stitch so they don’t slide off her foot. This is exactly the fitting changes I need to make on my own espadrilles. Thankfully, the final blanket stitch is really not that hard once you have done it. Kimberly from Straight Stitch Designs was up next and she showcased the upcoming wedges! Of course, she completely knocked it out of the park with this super hot peep-toe version. What is it about foot tattoos and heels?! Smokin’. I love that Kimberly went with a classic black, so wearable for her upcoming vacation plans. Lucky lady. Be sure to pop over to her blog to catch her buckle/ peep toe tutorials. She really laid out all the steps. And, if you want to catch the wedge kits when they release be sure to sign up for my newsletter. I’ve been working my tail off to get them out as fast as possible. 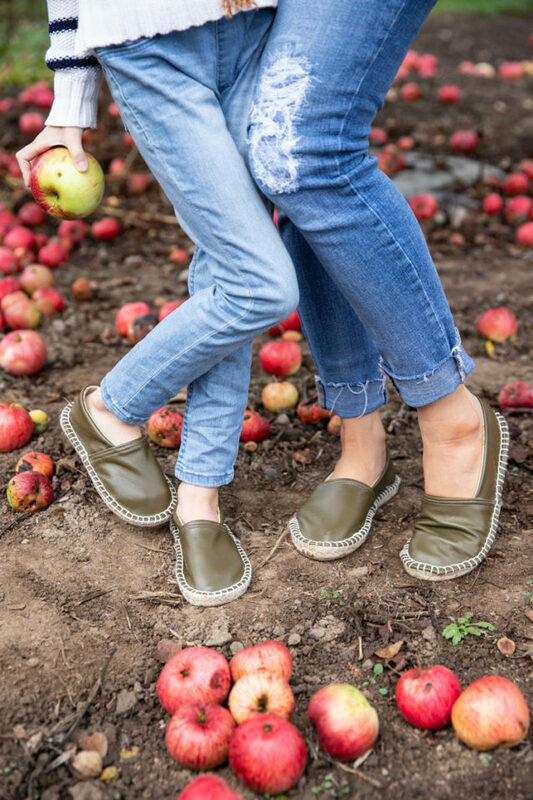 Delia from Delia Creates really upped her espadrilles game. She went with an I GOT IT kit in her and her daughter’s size and then went ahead and made them in LEATHER! I will be honest, my jaw dropped when I saw that she made metallic leather espadrilles. And, two pairs! So impressive. Sanae from Sanae Ishida also made two pairs. She made one for herself in classic black and a pair for her teen. I don’t know what I love more…how the shoes turned out or how beautiful it is that her young adult daughter was into mother-daughter shoes. 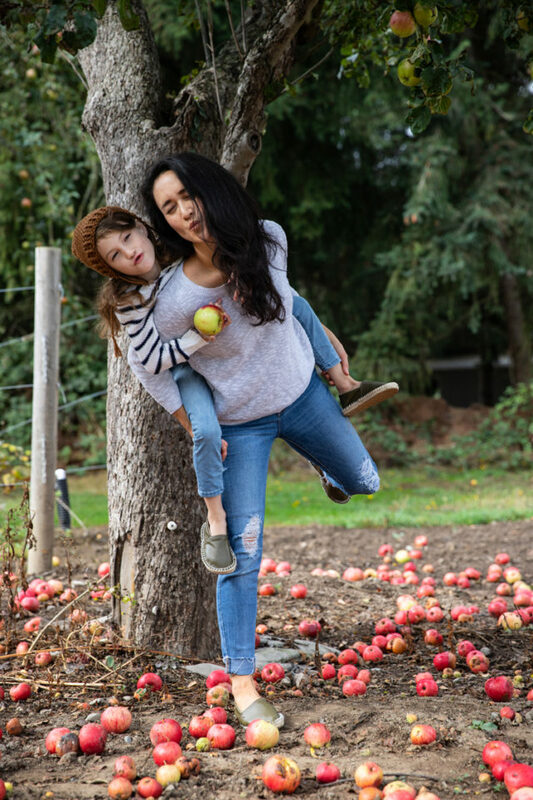 Sanae’s blog post goes in depth on how the shoes fit and how she’s working on getting the fit perfect. Do check it out! I really love the idea of parent-child shoe-making and was delighted that both Sanae and Delia tried it out. Such a fun idea. Along with wedge kits, I’m pulling together very thorough booklets for kid sizes so I can create kid kits and parent-child kits. So many fun things coming along in the next few weeks! 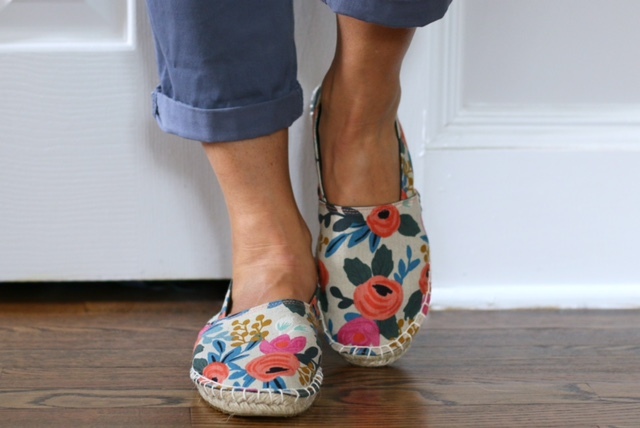 Thanks for joining me in ogling these incredible espadrilles on the espadrilles kit blog tour! I hope it awoke some creative juices. Shoe-making continues to give me this fun spark of enthusiasm. Even after selling kits for months and making them for years; I still get an energetic jolt along the lines of, “Ooh! I can make THAT!” Seeing what these incredible bloggers did only amplified that feeling.